The Genuine Hooligan Has Arrived! Introducing the Hooligan, Genuine’s most rugged, exhilarating and versatile scooter yet. Designed to dominate in the 200cc and under class, the Hooligan packs a mean punch. With its long wheel base, dual rear suspension and dual disc brakes, Hooligan is among the most powerful rides in its class. Loaded with extras, the Hooligan is equipped with a projector headlight, alloy rims, a digital speedometer, a large two person seat and plenty of storage capacity. This powerful 170 fuel injected scooter will bring out your inner Hooligan. Take it for a ride. Knock it around. 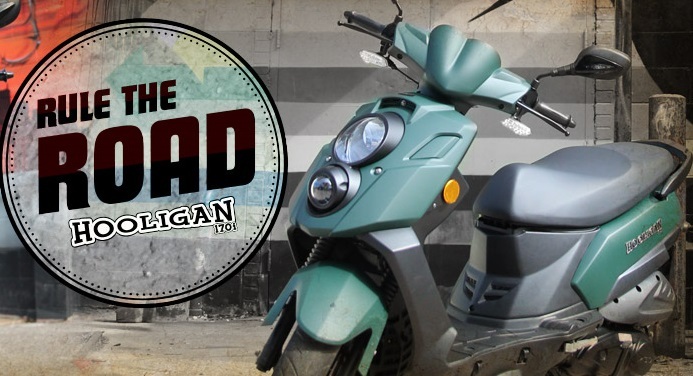 Rule the road on a Hooligan!